War of 1812 Naval Action on the Great Lakes by an excellent blogger. The American victory at the Battle of Lake Champlain, sometimes called the Battle of Plattsburg, on 11 September 1814 was the most decisive naval victory of the War of 1812. In September 1814 11,000 British and Canadian troops under Lieutenant General Sir George Prevost invaded New York State. Prevost’s men were a mixture of veteran units recently arrived from the Peninsular War, British soldiers already in Canada and Canadians. 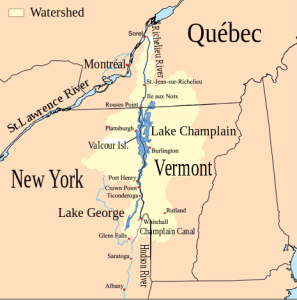 His intention was to march along the western bank of Lake Champlain. The lakeside town of Plattsburg was defended by fewer than 2,000 effectives under Brigadier-General Alexander Macomb. The British plan required naval control of Lake Champlain. Both sides strengthened their squadrons in August, with the brig USS Eagle being launched on 16 August and the frigate HMS Confiance nine days later.